A cold cool tomato soup is refreshing, nutritious, tastes divine and great for a hot summer day. This is a very tasty soup. This is a one bowl serving so if you are making it for two, double the recipe. In a blender or food processor blend all ingredients, until smooth. Add veggie salt or Spike Seasoning to taste. Now enjoy your cool tomato soup. 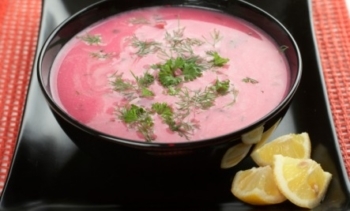 Borscht with a Difference – This tasty soup can be eaten hot or cold. Watermelon Soup – Here is another soup that is cooling like the Cool Tomato Soup . This makes a tasty meal for a hot day.